Molly Ayer has been in over a dozen foster homes in just 17 years of life. She’s been though plenty and despite her tough exterior of piercings, wildly colored hair and tattoos, she’s a wounded child inside. When she takes a tattered copy of Jane Eyre from the library, she’s required to do community service for the offense. Her service assignment is to help out 91 year old Vivian Daley, a wealthy widow who also lives in Maine. As Vivian’s story unfolds, it’s clear that she did not always have an easy life. 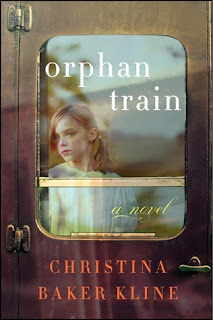 As a child, Vivian was an Irish immigrant who traveled with hundreds of other orphans by train from NYC to the midwest. As it would turn out, the fates of these children were mostly determined by luck. The story is told in dual narratives and, the characters come to life on the pages. I loved how the relationship between the two characters develops as they sort through boxes of keepsakes from the past. It was touching to see how Molly and Vivian had much they in common than one would expect despite a 70+ year difference in their ages. A moving story that was well written. This would make a good discussion book. The audio narrated by Jessica Almasy and Suzanne Toren. Molly Ayer has been in over a dozen foster homes in just 17 years of life. She's been though plenty and despite her tough exterior of piercings, wildly colored hair and tattoos, she's a wounded child inside. When she takes a tattered copy of Jane Eyre from the library, she's required to do community service for the offense. Her service assignment is to help out 91 year old Vivian Daley, a wealthy widow who also lives in Maine. As Vivian's story unfolds, it's clear that she did not always have an easy life. As a child, Vivian was an Irish immigrant who traveled with hundreds of other orphans by train from NYC to the midwest. As it would turn out, the fates of these children were mostly determined by luck.